Pre-treat any heavily stained areas with an appropriate stain remover (see Stain chart). Machine wash in cold water for best results. Air dry, blot, or wet-vacuum excess water. Soak fabric in a solution of 1/4 cup mild detergent, such as Woolite or Dawn dishwashing liquid, per gallon of lukewarm water. Machine was in cold water with mild laundry detergent. 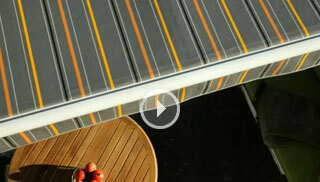 Allow Sunbrella to air dry, or tumble dry on “no heat” setting. Protect the area around your Sunbrella fabric when using a bleach solution – bleach may discolor non-Sunbrella fabrics. Always rinse Sunbrella thoroughly to completely remove bleach and detergent. DO NOT use a steamer or an iron with steam setting. If the fabric has some wrinkling, use an iron, but only on the synthetic setting. As some irons exceed the recommended temperature on the synthetic setting, test a small inconspicuous area before ironing entire piece. 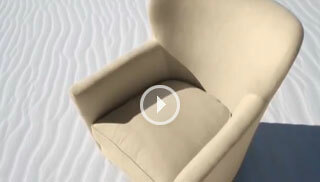 Video : Watch the Upholstery Care & Cleaning video.